Week 4 was not a good week. A HUGE amount of injuries occurred. Dalvin Cook is out for the season with a torn ACL. Derek Carr is out 2-6 weeks with a transverse process fracture in his back. Rookie hotshot Chris Carson is headed for the IR with a broken leg. And, as we saw Thursday, Ty Montgomery could be out several weeks with broken ribs. However, a lot of guys broke out this week. Deshaun Watson (hopefully you picked him up last week like I advised!) and the Texans put up 57 points on Tennessee, and Andy Dalton was red hot (pun intended) against Cleveland. Out of all the weeks, this week's waiver wire is up there with the best. All players are owned in under 40% of Yahoo! leagues. Also, last week's waiver wire pickups will not appear. If they are still available, pick them up! Will Fuller (32% owned) - Yes, I am a week late to the Will Fuller pickup party. I completely forgot about him. But, he's still owned in not even a third of leagues, so you can probably find him. In his debut game this year, he was a beast in the red zone, hauling in 2 touchdowns from Deshaun Watson. Houston's WR core is extremely thin, and Deandre Hopkins and Will Fuller will most likely share the majority of passes. Fuller is extremely talented, being one of 2016's biggest early breakouts before injuries ruined his year. In the near future, Fuller gets Cleveland, Indianapolis, and the LA Rams. Watch out. 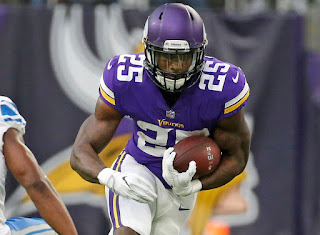 Latavius Murray (18% owned) - Most likely my #1 waiver wire add of the week, Latavius Murray is in a great situation. Last year, AP went down with a season ending injury and nobody inside Minnesota's backfield produced anything of substance, so Minnesota wouldn't form a committee. Though he was Dalvin Cook's backup, Murray is not too far removed from a 1,000 yard season down in Oakland. Running behind an improved o-line, Murray most likely will not produce at the same rate as Dalvin Cook but will put up RB2 or better numbers. Aaron Jones (12% owned) - Just like last year, the Green Bay Packers are stuck with an extremely depleted backfield. Ty Montgomery went down with broken ribs, and then backup Jamaal Williams went down with an injury, meaning they're both out for week 5. Enter Aaron Jones. He didn't do a ton with the carries he was given, but any volume means fantasy relevance. Plus, he can catch the ball and Aaron Rodgers is the quarterback. He faces an underwhelming Dallas defense this week in a shootout game. Alex Collins (10% owned) - The Ravens offense really, really fell off after two straight hot weeks. A the only positive, really, has been Alex Collins, new free agent find that's rushed for 80+ yards in back to back games. Terrance West isn't too talented, and Baltimore refuses to commit to Javorius Allen . Collins could end up being the early down back which would net him plenty of yards behind a decent Baltimore offensive line. The RB position is getting thinner by the week, and Collins is emerging as a decent FLEX. Jaron Brown (8% owned) - Even with John Brown back, Jaron Brown still produced for Arizona. He caught 8 passes for 105 yards against the San Francisco 49ers in an overtime victory. He's now gone over 10 PPR fantasy points in 3 straight games, a feat not even Antonio Brown can say he accomplished. Brown has HUGE upside considering how fast he is, and it appears as though he has sustained volume. JJ Nelson was a popular add a few weeks ago, but it looks like Jaron Brown is the guy people thought Nelson would turn into. Wayne Gallman (4% owned) - Paul Perkins is really bad. For reference, according to @LateRoundQB on Twitter, Paul Perkins is headed for the worst success rate ever, which basically means he's the worst running back ever. Gallman, rookie from Clemson, saw 50 total yards and a touchdown when Paul went down with an injury this Sunday. Gallman is definitely an important add regardless of format. Buffalo D/ST (15% owned) - The "defensive streaming" gang like myself have seen better weeks. Bad defenses play, well, each other. So we'll go with Buffalo, they're up against Cincinnati who looks red hot, but they caused 3 turnovers against Matt Ryan last week and have the 9th most points of any defense in leagues with return yards. I'm picking up the Bills this week and hoping these past couple weeks weren't a fluke.